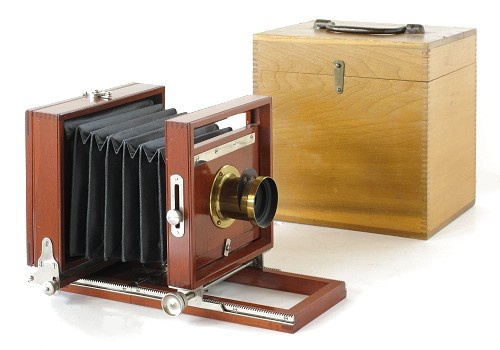 The Rochester Optical Peerless Camera was made from 1887-94 in formats ranging from 3-1/4 x 4-1/4 to 8 x 10 inches. It is a front focusing view camera with a highly polished mahogany body, cherry bed, and nickel trim. The back is non-reversing and has a single swing. This is an early 4 x 5 model with R.O.Co. 4 x 5 brass lens. Its always interesting to look at a camera design and reflect on its name. Considering its finer construction for a camera of the late 1880s, Rochester Optical must have felt that this camera was without peer -- or "Peerless".